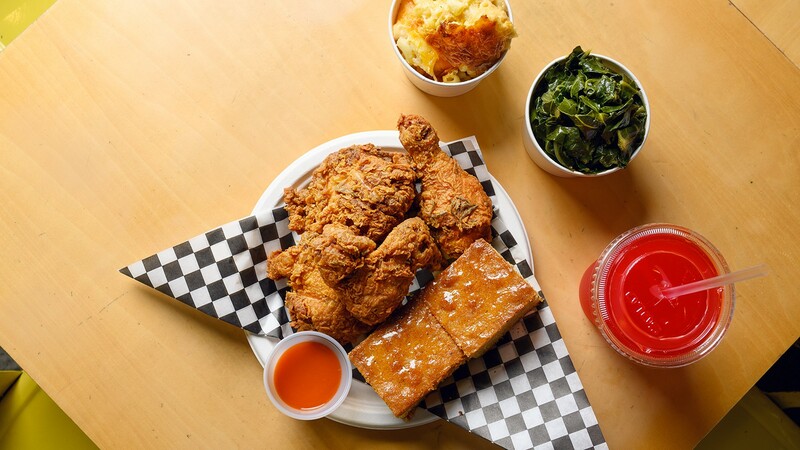 Lifelong Fillmore resident Fernay McPherson serves her signature rosemary fried chicken, brown butter cornbread, and more at the Emeryville Public Market. The rosemary fried chicken is exceptionally juicy. Her father, too, was born and raised in the Fillmore. “He’s seen so much more than I have, of course. He can just take you around and tell you what everything used to be, which is fascinating to me. But some things haven’t changed. McPherson still lives in the Fillmore, just down the block from her childhood home. And she’s continuing her family’s tradition of gathering together over good food. After all, that’s where her passion for cooking originally came from. “Gatherings — those were always my favorite times,” McPherson said. “My fascination was just all the food that my family would cook.” At the age of 9, she began cooking with her mom, grandmother, and auntie, learning to make mac ’n’ cheese and dinette cake. So when McPherson was laid off from her job in 2008, she decided to pursue cooking professionally and headed to culinary school. In 2011, she joined San Francisco food business incubator and nonprofit La Cocina. She ran a food truck, catering business, and pop-up, and in 2017, she was named one of the San Francisco Chronicle’s Rising Star Chefs. In March 2018, along with continuing her catering business, McPherson opened Minnie Bell’s Soul Movement in a corner kiosk in the Emeryville Public Market — her first brick-and-mortar location. As for the “Soul Movement” part of the name, that’s a holdover from the food truck days — but it’s still accurate, given the huge following that McPherson has already amassed after less than a year in business as a brick and mortar. With fried chicken this good, the sides had a lot to live up to. I started off with the mac ’n’ cheese, made with cheddar, Fontina, and Parmesan cheese. The top was covered with a layer of gooey melted cheese, plus the macaroni had plenty of sharp, cheesy flavor throughout. (This mac ’n’ cheese definitely falls on the cheesy rather than creamy end of the spectrum, which I’m a big fan of.) It’s not the same recipe that McPherson grew up making at family gatherings — this one uses a béchamel base — but it’s very good. Don’t miss the braised greens, either. They’re vegan, but still pack plenty of flavor thanks to the veggie broth, pepper flakes, and spices they’re cooked with. The subtle heat and richness of the broth complemented and tamed the bitterness of the collard greens. And one of the best items of all is one that’s offered gratis: the brown butter cornbread. McPherson said she created this recipe when she accidentally browned the melted butter called for in her cornbread recipe. “It made the cornbread come out a whole lot better,” she said. The brown butter gave the cornbread a nutty flavor. The edges were simultaneously crisp and chewy, while the center was soft and cakey. And the addition of sugar in the cornbread provided a nice contrast to the savory flavors of the other dishes. With food like this, it’s no wonder that McPherson has amassed a following so quickly. “It just happened right before my eyes,” she said. A tweet from the mother of Golden State Warriors’ star Draymond Green couldn’t have hurt, either. Plus, McPherson has a loyal following of born-and-raised San Franciscans — some who still live there, and some who have since moved away and are touched by her story. And, McPherson said, “We are the only African-American business inside of the [Public Market. ]” Though the lease on her corner space will end in March — it’s a rotating temporary pop-up space for La Cocina — McPherson said she plans to move to another space in the Public Market when that lease ends. I, along with what I imagine are many others, will be glad to have Minnie Bell’s on this side of the bay for a little longer. But McPherson is still pursuing her dream of opening a restaurant in the Fillmore. “I would love to have a breakfast-lunch joint,” she said. There, she’d have more kitchen space to expand her menu beyond fried chicken and mac ’n’ cheese and “put more of what I do on display.” It’ll be sad to see Minnie Bell’s go when that happens, but McPherson’s food is definitely worth traveling over the Bay Bridge for. “I will continue trying to reach that goal until it happens,” McPherson said. Hours: Mon.-Sat. 11 a.m.-3 p.m., 5 p.m.-8 p.m., Sun. 11 a.m.-3 p.m., 5 p.m.-7 p.m.